What options are available in skeletal types of veterinary canine models? Veterinary canine models come in a wide range of options, and are most definitely not limited to just skeletal representations. There are many models that feature joints and skeletal parts, since these are commonly injured or diseased areas in dogs. The common joint models include the pelvis, elbow, shoulder and knee along with the vertebrae and the jaw. The jaw model is very realistic and is not the actual jaw bone itself, but rather the teeth in the gums in a realistic presentation. 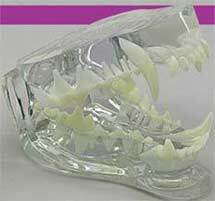 A clear canine jaw model is another popular option to show the adult canine teeth and their position in the mouth. Other options for canine models that provide a lifelike view into a particular organ include the heart, heartworm model and the canine skin model. All are designed to be very accurate in their detailed presentation of the structures as well as the specific pathologies shown. In a vet's practice a two-sided canine ear model that shows inflammation and blockage on one side and a healthy dog's ear on the other is perfect for assisting owners in understanding the importance of routine hygiene programs for their pets. I would like to use veterinary canine models in my practice to show my dog owners common disease conditions. Which ones are most popular and helpful? Any and all of the veterinary canine models can be extremely helpful when working with pet owners. 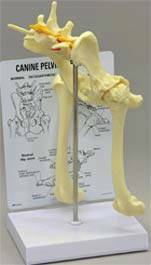 The skeletal anatomy models are perfect for discussions about the often inherited conditions such as luxating patella and elbow, hip dysplasia and arthritis in dogs. In addition the models of the canine shoulder, pelvis and vertebrae can also be used to show various conditions including trauma caused by falls, vehicle accidents or other types of injury. The information cards provided with the models give labels to each of the bones and structures allowing owners to follow along with the discussion. In addition the highly detailed 3D models also have the same type of educational card that may be used to provide more information about the specific healthy organ or the pathology displayed on the model. One of the veterinary canine models that has a huge impact on owners is the heartworm model. This 3D model clearly shows the worms in the heart chamber exactly as they can occur in real life. This visual helps to keep owners using regular heartworm treatment in areas where this is a concern. Are there the veterinary canine models that show pathologies or only those that show healthy joints and organs? Depending on the manufacturer of the model, both healthy models as well as veterinary canine models depicting pathologies are available. Having both on hand to use with dog owners in general discussions about preventative treatments as well as in discussing treatment options and short and long term recovery is very helpful. Using the models help the owners to understand even very technical issues without a lot of explanation of anatomy and psysiology on your part.